Teaching your dog to leave it or ignore something on your cue can be lifesaving. Just imagine dropping a pill in front of your dog or going for a walk with your dog as you pass garbage in the street. If your dog has a reliable leave-it command, you can easily ask him to leave it as you pick up the pill or walk past the garbage. When I start the leave it training, what I want my dog to learn is leave it doesn’t mean he doesn’t get something, but that I have something better. I feel this provides a more reliable behavior, especially off leash. If you just teach your dog leave it means he doesn’t get something, he’ll learn just to be faster in his attempts and run off if he does grab the prize. Not something I would recommend. As with all dog training, it’s important to remember that you need to regularly teach your dog the dog-training lessons, not just once and then only when you need your dog to leave it. Reliable dog training just doesn’t happen that way, and it certainly doesn’t happen after a few sessions. Be patient, consistent, and have fun! Note: Your dog’s reward treat should be more valuable than his leave-it treat. 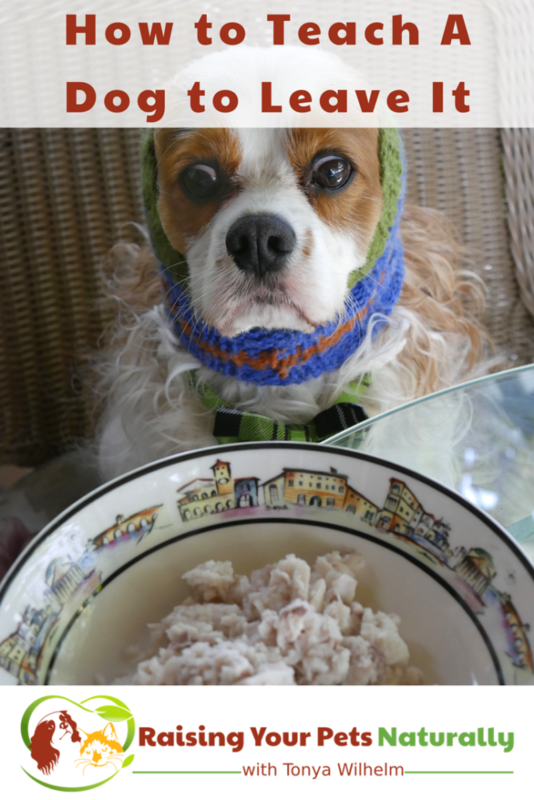 Have a small low-value dog treat in your closed hand and place it about 12” to the side of your dog’s face. You want to place your hand at the right height so that he’s not jumping up, it’s not in his face, but not too far away. Let your dog know it is there. Wait him out; as soon as he moves his face away or ignores the treat say, “YES!” and give him an amazing treat from your other hand. Not going for the treat is a win, too! Repeat. When your dog starts to ignore your hand, move to level 2. Start your setup like level 1. But, this time, right before you drop your hand, say your leave-it cue once. Wait him out; as soon as he moves his face away or ignores the treat say, “YES!” and treat from your other hand. Not going for the treat is a win, too! Repeat. When your dog stops going for your hand after his leave-it cue, move to level 3. Say your leave-it cue and drop your hand with a low-value treat to your dog’s side, but keep your hand OPEN. If he goes for the treat, quickly close your hand. When he moves his face away, praise and give him a treat from your other hand. Repeat. When he’s reliably ignoring your open food hand, go to level 4. Up until now, you’ve been using a low-value, boring dog treat for the leave-it item. Once your dog is understanding what leave it means (he ignores something boring and get something better), it’s time to teach him leave it can be anything. Start your training sessions as before, but, this time, increase the value of the leave-it item. However, you still will want to also increase the value of his leave-it reward. You want his prize to still trump the leave-it item. Stand in front of an open, indoor doorway with your dog in front of you. Say your dog’s leave-it cue as you toss a low-value treat behind you. Be prepared to play goalie! If he starts to go for the treat, play goalie and prevent him from getting the treat. Be prepared; you will have to be fast. As soon as he steps back away from you, praise and treat with a better treat. Repeat. Make your own levels by slowly increasing the difficulty level. If you ever find your dog making mistakes, decrease the difficulty. The goal is always to work at your dog’s level and for him to be able to win. If you move too fast, you will only be frustrating him and likely teaching him to just outsmart you. Quick Reminders – Never allow him to get the leave-it item. If you want him to have the leave it item, YOU pick it up and give it to him. 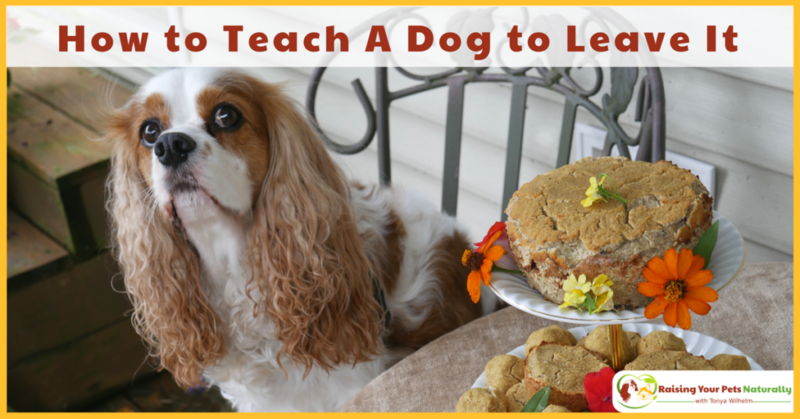 Leave it is a very valuable behavior to teach your dog, but it is one that takes thoughtful preparation and setups. Now, go give it a try! How’s your dog’s leave it cue? Tell me in the comments. Wife and I often walk at Newhall park. Even though there is an enclosed area for dogs, there’s almost always dogs off leash. One day, the police sat in the parking lot while a guy was playing with his dog off leash right in front of them. They just ignored him. Then there are the same people who never have their dog leashed. And Mr. jogger NEVER picks up after his dog, which is, of course, unleashed. On days when the dog part is closed, people think it’s an excuse to let their dogs go where ever they want! We’ve stopped walking the canal trail (aka dog poop trail) because it’s gotton so disgusting. Unfortunately, it’s not just dogs pooping there either! I hate irresponsible dog owners! Shame on the police for not making someone follow the law.